Click here for our 360 Tours! 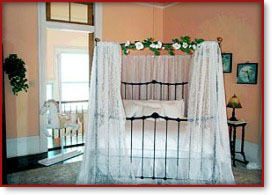 The HH Whitney House Bed and Breakfast offers 3 guest rooms and 2 suites which may be combined in a variety of ways to best suit our guests' needs. The house sleeps a maximum of 10 persons in the five bedrooms, each of which features one queen-sized bed. All rooms are equipped with digital cable TV, alarm clock with radio and CD player, ceiling fan, bathrobes and slippers, iron and ironing board, as well as hairdryer and bath amenities. The Solarium Suite offers luxury accommodations for an intimate stay for two or can be combined with the Groom's and/or Bride's Rooms for group or family vacations that sleep up to six. The combined suite is known as our Family's Quarters. 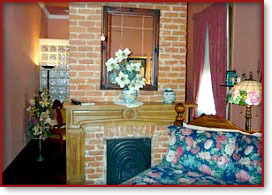 A stay in this suite transports you back to an earlier time in New Orleans where you can enjoy your own private sitting parlor just as former owners have over the past 140 years. Wrap yourself in an overstuffed leather armchair and ottoman with your favorite book. Experience the grandeur of the oak-canopied Esplanade Avenue, as you sip a cocktail and relax on the gallery. Retreat to your luxuriously-elegant private bath, where you may soak in an antique claw-foot tub and gaze past the crystal chandelier up at the dreamy faux-finished walls and high ceiling above you. Rest up for a night on the town by taking a mid-afternoon nap in the cozy solarium alcove which cradles your queen-sized antiqued-white metal bed. The suite also features a traditional nubuck leather sofa, tapestry-upholstered wingback recliner, 27-inch digital cable television and VCR. This room is sure to please every young lady. A queen-sized black-iron feather bed is dressed with boughs of flowers and draped with lace and set against a soothing faux-finished peach backdrop. A full-length window opens onto a small balcony which overlooks the carriageway. This room is best utilized as a second bedroom in conjunction with either the Solarium Suite or the Groom's Room, either of which may be entered by virtue of connecting pocket doors. The Bride's Room shares bath facilities with one of the adjoining rooms. If rented independently, occupants of the Bride's & Groom's rooms agree to share the original hall bath, which has an antique claw-foot tub with shower. A separate water closet is provided for added convenience. This room features a queen-sized Cypress panel-door bed hand-crafted from two doors that once connected this room to the servants' wing. 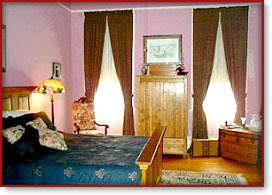 The plum-colored room carries a masculine theme with decor that includes weapons dating from the Civil War. Two windows offer a view over the carriageway below. Guests use the home's original hall bath located just a few steps outside of this room. The bath may possibly be shared with occupants of the Bride's Room and features an antique clawfoot tub with shower and a separate water closet. This room may be combined with the Bride's Room to be used as a two-bedroom suite by virtue of a connecting pocket door. 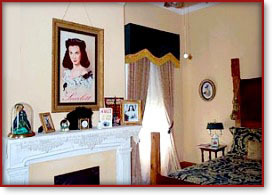 It may also be used along with the Solarium Suite and Bride's Room to form our deluxe three-bedroom, two-bath suite known as the Family's Quarters. 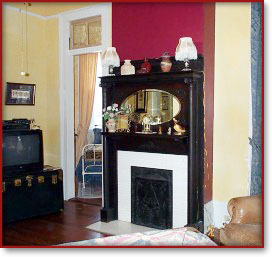 Formerly our Servants' Quarters, this space was converted from two separate rooms in the former servants' wing. Featuring an exposed brick fireplace which serves as a natural room divider between the bedroom and the bath and dressing area. This suite features a queen-sized pine bed, 20-inch digital cable television, private balcony overlooking the rear garden and its own heating and cooling system for your comfort. The in-room bath features an oversized glass-block enclosure with dual shower heads. This cozy suite affords the most quiet and privacy.